Do I Need to Paint the Whole House White? You are getting ready to paint a home you know you will sell within a couple of years. 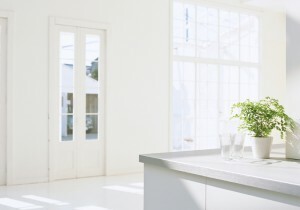 Chances are, a helpful family member or friend reminds you that to sell, everything should be painted white. After all, a buyer needs a neutral “clean slate” to look at. Just the thought of all those white walls and ceilings gives you the feeling of a fog machine at a rock concert, so what do you do? There are several options other than white or off-whites to give a room a neutral look. In fact, many times a little color is better than white. Here’s why: White is not white is not white, meaning that there are dozens of variations on white that can make or break the look of your walls. Some whites reflect light more warmly or coolly than others do. If you choose the wrong white, your home will seem harsh and stark rather than warm and inviting. White also reveals flaws and cracks in drywall, shows up patches and nail holes and shows dust and dirt more easily than other neutral colors. In addition to that, a 2004 survey conducted across seventeen countries revealed what white is the world’s least favorite color. So, which colors should you use? Nature inspired neutrals include soft earth tones such as some warm reds, tans and browns, greens, and other muted tones. Coffee colors, ranging from light latte to deep mocha or espresso, are both popular and excellent complements to hardwood flooring and tile. The same survey that put white at the least favorite, shows blue is the most popular color in the world. So, adding a pale sky blue can soften a stark room. Blue also lends a hint of sophistication and evokes feelings of summer days spent at the beach. Similarly, sage and mossy greens add a hint of a cool forest and gives walls a calm, soothing and stress-free quality. One way to give your home depth and dimension is to use various shades of the same color— deeper in an alcove, lighter or darker on the ceilings. Contrasting colors enhance a large room, but might break up a small room, so consider painting the trim just a shade darker than the walls instead. Use a deeper shade or complementary color to highlight a particular architectural feature, or alternate warm and cool colors to make a room appear longer or wider. Using a color similar to the view outside the window can bring the outside into your home and perceptually enlarge your space. Just remember that when it comes to selling your home color can be your friend. Call your local real estate professional to learn about trending color schemes in your area.